Almost a year ago to the day, a curious press release landed in my inbox from New Zealand First Leader Winston Peters. “New Zealand First says there’s no threat to our key primary industries from 3D printed milk,” the opening line read. I was confused by the email – “how is 3D printed milk even possible,” I remember thinking to myself. This is a question Peters did not answer and, as I read further, I realised he was talking about artificial milk and how it would never be a substitute for the real thing. “Okay, good to know,” I said to myself, as I dragged it into the trash folder to sit alongside countless other NZ First press releases. It’s not that I had anything against the party or Peters. But at the time, me – and every other political reporter – were receiving press releases like this every day. Peters was barking at every passing car for attention. But, it was working – this time last year, NZ First was polling north of 10%. 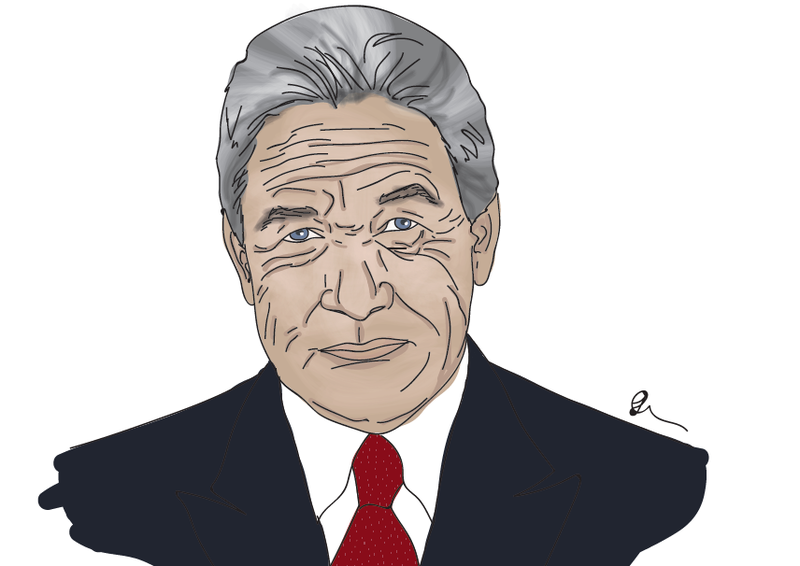 On Monday, a Colmar Brunton poll put the party at 4.2%. This is despite a huge win for NZ First in the Budget. Peters was given nearly $1 billion to beef up his foreign affairs portfolio, which will be used for foreign aid in the Pacific and to better resource the Ministry of Foreign Affairs. This was on top of Shane Jones’ $3 billion Provincial Growth Fund. And just last week, Peters got another win with the Government spending $50 million to “rejuvenate” Northland’s economy. In terms of policy and Budget wins, NZ First is way ahead of the Government’s support party, the Greens. So why is NZ First faring so poorly in the polls? The answer could be, people like the old Winston – the “3D printed milk is not a concern, unpolitically correct, tell it like it is” Winston. It is an understatement to say he has been flying under the radar lately. Last week, he travelled to China to discuss the next round of free trade talks. The trip got next to no media attention, despite the fact he had been warning about the growing influence of China in the Pacific for months. Since becoming Deputy Prime Minister, he has taken on a noticeably more reserved tone, similar to the last two times he was a senior Government Minister. It cost his party in the polls then, as it has today. Prime Minister Jacinda Ardern is due to have her baby on June 17 and for at least six weeks after that, Peters will be in charge. There will be no escaping it, he will be thrust firmly back into the spotlight he so desperately craved this time last year. Peters has a choice to make: does he continue his diplomatic demeanour to give the impression of a strong, stable, united Coalition Government? Or does he withdraw back to his pre-election days to help give his party a bit of a bump? My guess is the former. It’s too far out from an election for anything he does now to have a material impact on the polls in two and a half years’ time. Voters have short attention spans and Peters of all people knows this well. NZ First’s support may be low now, but no doubt Peters has a plan to improve it closer to election day. Come 2020, I doubt he will be crying over any spilled 3D milk. A primary reason why many people I know voted nzf was for reduction of immigration. To date there has been no substantive change in immigration policy. Maybe this has some bearing on the low polling numbers? I voted for Ruth Dyson my Labour MP because she is an outstanding representative for her people. I don’t usually vote for Labour and anyway my party vote was to NZF as I thought this might prove to be a handbrake on a tax happy Labour led government. When the Labour party publishes what Dr Cullen has decided for them, as far their tax grabs for the next term, the coalition is going to be rather hard pressed to remain popular. The only chance then for NZF to survive that election, is for Labour to do an Epsom, and stand aside in Whangarei. Journalists should know how to use pronouns properly! Half of NZF voted for them for a Labour/NZF coalition, the other half voted for a National/NZF coalition, the sore losers have deserted them. Why is anyone surprised at the poll results? Nzf got 7% on election night and are on 2.4% now (reid research) so have lost about 60% of their voters - who seem to have not wanted Labour-Green. To describe them as sore losers is disingenuous, they obviously feel betrayed by Winstons venal bauble-grab. NZF are toast at next election, having betrayed their core older conservative constituency with stupid, low information, short memory attributes that they display. Winston has chosen his short term jollies over long term survival of NZF. He is obviously not interested in NZF beyond this term. I’ve yet to meet someone who openly admits to voting NZF. I suspect my parents and in-laws do because of comments made against rogernomics and Ruth’s later mother of all budgets, and they definitely aren’t greenies. These people haven’t been in paid work in 25 years and have mild xenophobia. They are stuck in last century and vote to get revenge on parties that upset them decades ago. I’ve yet to meet someone who openly admits to voting NZF Int the 1980’s I think I would have voted for Muldoon (if I had been old enough). I don’t like neoliberal economic policies. I think financial engineering, and the cross border free flow of capital isn’t working in my favour. Now I vote for Labour because they aren’t National. It's quite possible that NZF will get my vote in the future. I wish you well, although you may want to hedge your bets and pray to St Jude or St Lucy. No need to prey. Just vote for political leaders that make rational decisions based on sound logic so that prosperity is maximized. Question is property/prosperity for whom? If you’re a baby boomer then National is the logical choice. I should have added they tend to poll badly between elections as well, I suppose. Not sure if they will recoup most of their vote, trying to hold the middle ground has its hazards. Stuns me, the blind loyalty people show National, each day delivers yet more information as to how truly awful they have been. You mean fake news like the sewage in the walls? Pot kettle black re the COL. National support is going to remain strong and we live in hope that in a year or so the swing voters will start to realise they’ve been sold a pup. We don’t want the shift to happen too early otherwise it will shift the current leftie complacency. Now Rex Pat, you shouldn't pick up and run with Matthew Hooton's PR efforts over this so readily. Turns out he was wrong in his rewriting of things. The Counties Manukau DHB has said it was first alerted to leaking buildings in 2012 but, in fact, it was warned in early 2010. "The cladding system to the lower levels of the building appears to be failing," the February 2010 report by surveyors Dalton said, after it took off cladding at five spots on the south wall of the Scott building, which also houses cardiac care. It photographed advanced brown rot and light rot in wood frames it rated as "unsound" and described "widespread incipient decay" caused by leaking. "The use of untreated timber and established decay at corners and sheet edges demonstrates that the [three] lower level storeys are at risk of real future failure." Counties Manukau DHB acting chief executive Dr Gloria Johnson said that when she told the public in March this year that they were first alerted to the leaks in 2012, she was not aware of the 2010 report. The Dalton report includes a photo of a fece-stained first-floor sewage pipe, where leaking caused "serious damage" to framing. Board's chair Rabin Rabindran, a board member Mark Darrow and the DHB itself have all said media reports of sewage leaks were overplayed. It's now known there were at least four such leaks of raw sewage. Greg Simpson, the facilities manager from 2008-16, said: "I do recall that report, and I recall quite clearly reporting that to senior management... and the first board." Best to check the facts rather than only the right-wing commentators. For the last several election cycles the same thing has happened. New Zealand First poll poorly through the 3 year cycle only to make a bunch of noise and get above 5% in the election. Surprising a political commentator has not noticed this or doesn't see fit to mention it, as what we are seeing follows this normal pattern. What happened to Winston? He got what he wanted. It could get interesting if just prior to next election, Labour polls strong enough to govern alone and Peters thinks NZF might be cast aside. Peters doesn't give a toss. Its all about him (always has been). He will behave as did Peter Dunne, once he decides to leave, the party is an irrelevance. Dunne got his prestige and extra funding by having a "party" but didn't even bother to pretend an organised handover. Peters will probably hand over to Jones so Jones can carry on the tradition of self service. Now in power who cares and will raise the issue near election time to get votes. Typical of Winston Peter and also Labour. Real shame to supporters of both the party. New Zealand First will be toast at the next election and Winston won’t be around! Winston has hardly been seen since the election and there is a reason for that if the rumours that come from pretty good sources are true. Let's not disremember the letter handed to Winstone Gander from the PM: essentially saying "Watch it, bud, I may be Labouring but never ferget Whose Hand is up Your Glove". This is bound to happen to any centralist minor party. If they hold the balance of power they are bound to disappoint a percentage of their voters when they chose a coalition partner(s). This is why the idea of a centralist Green Party just wouldn’t work - they may get to be kingmaker once, but they will probably suffer forever after. Winston and NZF have some good ideas. The NZ media tried to do a hit-job on Winston both before and after the election. I could see what they were doing. After the election the arcitles were vociferous, content inane and often could be considered 'fake news'. "Winston has hardly been seen since the election and there is a reason for that if the rumours that come from pretty good sources are true." C'mon TM2 - you're not playing the "illness" card are you....? Watch this space, interesting times ahead. Winston is the baby's father? Is Winston having a gender reassignment? He represents everything wrong about our political system. And also how greens do not deserve a single vote. Dear Mr Peter's. The chance of a lifetime is coming. As soon as Jacinda's off you must reverse every crazy idiological failure of law she's been responsible for and outlaw the labopur party under some anti-gang legislation.